The bridge with the arrow is indeed under the highway, but it's not Nihonbashi - it's the 4th bridge to the West of Nihonbashi. 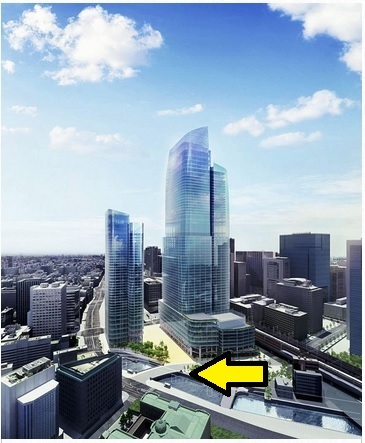 You are right about the bridge: it is not Nihombashi. Nevertheless, the Shuto Expressway is gone. I have heard numerous promises to bury the expressway. They always seemed disingenuous, encouraging citizens to OK projects based upon an impossible dream. This artist's rendering, however, presumes the elimination of the elevated section.